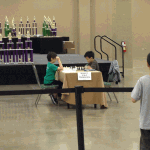 Whenever I go to a chess tournament with Daniel, I focus on enjoying the experience. Yes, I am also supportive of his pursuit of achievement and desire to win; but I it’s as rewarding, if not more, to enjoy the experiences — meeting new chess parents, the dinner at the hotel restaurant (where the tournament is played), the pool time, or analyzing games together. My good friend Jay reminded me how important experiences are really. Thank you Jay! 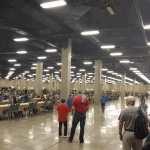 This year’s elementary nationals were in Nashville at the Gaylord Opryland resort. We all went together to support Daniel in his games at the K-3 Championship section. Participating were more than 2200 kids in various age groups. The amount of energy in the air was mind-boggling; so many kids; so much chess; it was fun and exciting. I have to say this was by far the best chess tournament I attended, mostly due to the venue. 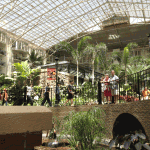 The Opryland resort is fantastic, and there are many things to do in between games, right there at the hotel – pools, restaurants, arcade room and much more. Chess tournaments are a wonderful social opportunity, and we really enjoyed meeting many young chess masters and their parents. During the tournament, Daniel had an opportunity to play against the top-seated player in the section, on board #1 in the middle of the tournament hall. In this day and age, focusing on something is not as easy as it used to be. I know for me it isn’t. Yet the ability to focus on any activity is tremendously valuable. In chess, the ability to focus is a clear advantage: when you practice, when you study, and especially when you play. So regardless of anything else your child is doing to improve his/her chess — practicing the simple act of focusing will have an amazing impact. Focus, Focus, and Focus! Today, I received a rather interesting email. It was a from Sergey Brin and Peter Thiel, addressed in person to me. clearly, I was surprised. In the letter they expressed their childhood passion for the game of chess, the impact it had on their adult lives, and go to describe a special education program they are working on that focuses on chess. From the details in the email, the program sounds like a “chess version” of Thiel’s Quit College program. Here, 20 young chess prodigies (out of 100 initial candidates) will be selected to attend a new school (located at the Google Campus in Mountain View), where educators will follow a special program designed by Brin and Thiel, focusing on chess as well as math, science and business. To be selected to this program, Daniel will have to play 2 games (one as white and one as black) with Sergey and with Peter. It’s not clear what the selection criteria is, but at the end of May 2012, 20 lucky kids will be selected. Wishing everyone a great 2012, in life and in chess!